The second Coder’s Panel was like last year’s Geek panel. We got to ask tech questions of SOE devs of all games. It’s not for everyone but its one of my favorite panels. I love behind the scenes stuff. Getting ready for the Banquet, Costume Contest, and any surprises they throw at us. We’ll also see the premiere of Dethdlr’s winning SOEmote video! If you have been reading some of the panel notes going “Wha?” I’ll be going through tomorrow am before my flight adding in some more meaning and formatting as well as a few more panel photos. They’ll be worth a second read. Later this week you’ll see the 55GB (11 hrs) of video get posted on our YouTube channel. I don’t want to misquote anyone, so I am transcribing the most clear-cut questions and answers. Anything else will be in the transcript video. Question about tradeskillers making kilts and getting more styles. 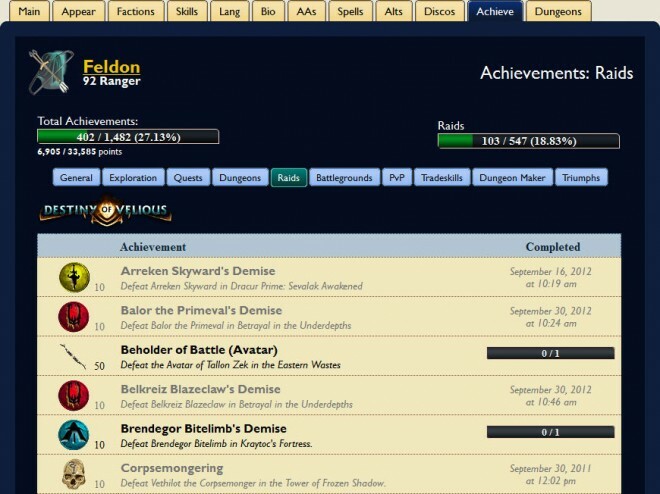 Q: Freeport and Qeynos lets anyone do writs. Neriak is more picky. Gorowyn is selective as well. Can this be made more consistent? Q: A Krono is $17.99. Why is it more than 30 days sub costs at Walmart for $14.99? A: We don’t endorse the selling of cards in-game, but it’s a completely supported in-game method of trading in-game subs. Q: Are you going to try to stop selling cards for plat? Headed to Podcasting panel soon. 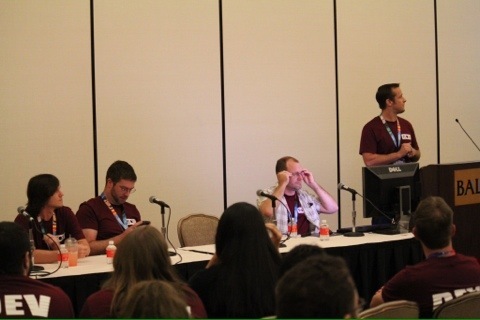 Dellmon of the awesome EQ2Talk podcast on the panel. Will record a video. Already 7 hours (30GB) of vids, including our EQ2U panel, to crunch down and post. Panel starting now. Dev intros. So for those folks behind on AAs, if you buy Chains of Eternity, you get an item you can claim 2 per account (not 1 per character) that if you are level 90 it dings you to 280AAs. Waiting for Keynote #2 to start. Supposed to EQ, EQ2, and DCUO. Brasse talking about nVidia sponsor. Military gamers on stage. 10, 15, 20 years. This is for an nVidia GeForce 6600Ti card. DCUO keynote up first. Will come back with EQ2 stuff. Wrapping up DCUO. Waiting for EQ or EQ2. This is a more behind-the-scenes technical type panel, so will not be covered live on EQ2Wire. I’m recording a video. Also got a video of the ProSieben panel. Thanks Dedith — you rock!!! UPDATE: Getting Cozy with Coders was not like Geek Panel last year. Instead, it was EQ2 devs at the front of the room and players can just go up and ask them questions. So kind of an organized Kelethin, without alcohol. Next info is SOE Keynote at 6:30pm PDT. Sorry for the late start. I am videoing this panel as well. Just starting the EQ2 Art & Animation panel. This is a visual panel, so not going to be a lot of updates. Showing a flythrough of a new outdoor 3D dungeon that’s being worked on. Recap of info that has been posted so far. Can’t make it to SOE Live? Don’t worry. We’ve got you covered with an extensive schedule of live casts! 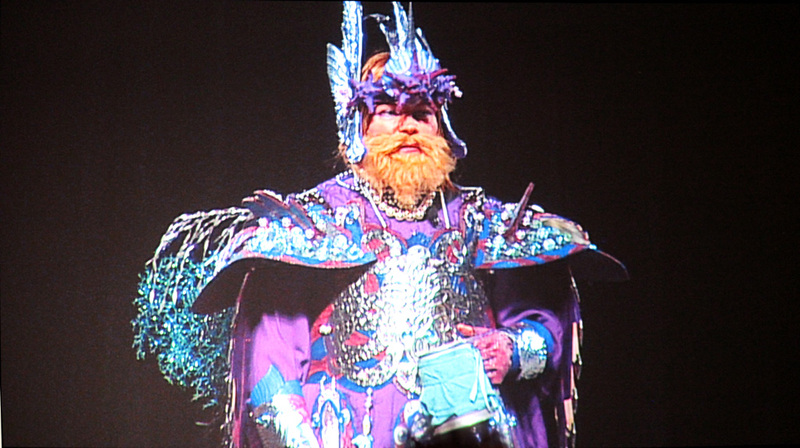 Starting with the opening of the show through our annual costume contest, we will we keep you connected with all of the happenings at SOE Live! Here is a schedule of when you can tune in and where. Broadcasts will occur on the SOE Twitch TV channel, the PlanetSide 2 Twitch TV channel, and on CurseTV! If you have attended past Fan Faires and are an iPhone user, then you are likely already familiar with Greg “Rothgar” Spence‘s Fan Faire iPhone app. Greg developed this app in his extremely limited spare time and has maintained it over the past two years. If, however, you are an Android or Windows Mobile user, you’ve been waiting for your own app for going on 3 years now. 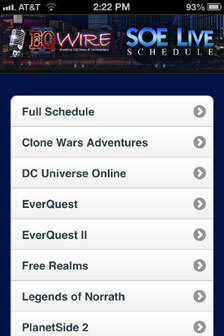 Greg developed his Fan Faire Schedule app for the iPhone because that’s the device he owns. He’s always been eager for others to step up and make their own apps for Android, Windows Phone, Palm, BlackBerry, etc. Our own Dethdlr, Chief Architect of EQ2U, took that challenge and in just 2 days of development, was able to choose “all of the above”. On Thursday, October 18th from 5-6:30pm, Morgan Feldon of EQ2Wire and Dethdlr of EQ2U will be having an informal get-together at Le Burger Brasserie in the bar area. If you will be in Las Vegas for SOE Live or for whatever reason, feel free to drop in. If you are not familiar with Bally’s, this is the first restaurant on your right when you enter the corridor leaving Bally’s towards Paris. 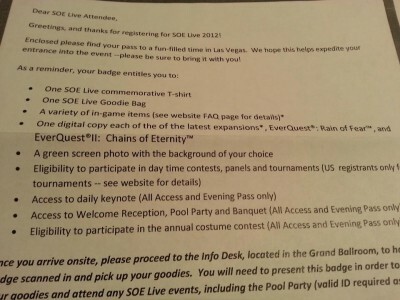 It turns out that attendees of the upcoming SOE Live 2012 who purchased a Day Pass ($40) to attend either Friday or Saturday events in Las Vegas will get not only the EverQuest: Rain of Fear and EverQuest II: Chains of Eternity expansions, but also the in-game items. This is unusual compared to past years where only the $140 All Access Pass option granted said items. Don’t miss this opportunity to get a great deal on an EPIC weekend! Pre-register for SOE before Sunday, September 30th Monday, October 1st and pay $139.00! If you wait to register on site you will pay $159.00! Join us for a weekend filled with tournaments, panels, Live Quests, and more. Need more of a reason to come? If you play EverQuest II, your in-game item is Dashenti Lasheris! Once consumed, you can purchase Dashenti Lasheris. She is a Fighter Type Mercenary. SOE Live Player Panels Announcement Today? 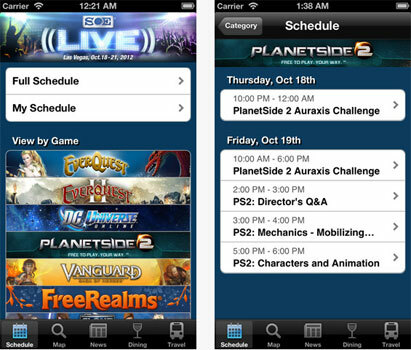 Finalizing #SOElive player panels today! With 16 submissions and 8 slots, trying to work some magic to fit as many as we can! Cyliena of EQ2 ZAM followed last Thursday’s LiveCast and was able to grab a screenshot of the in-game item which SOE Live ticket holders will receive (regardless of attendance). NOTE: During the Livecast, the merc was indicated to be a healer, but since that time, this information was updated to a fighter merc. With just over a month until SOE Live, we know you are dying for more details! Host Linda “Brasse” Carlson (Director, Global Community Relations) will chat with Jen Belfield (Director, Marketing Services) and Lauren Zeiger (Senior Strategic Partnerships & Events Manager) to share many of the exciting events that will take place at SOE Live this year. They will tell you about the recent updates to the schedule, share info on the HUGE tournaments, and so much more! 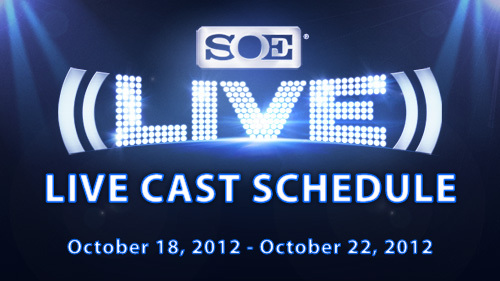 If you have any questions about SOE LIVE, please post them here, and we’ll do our best to answer them! Join us on Thursday, September 20, 2012, at 4:00 p.m. US Pacific Time* on Twitch TV! The webcast is expected to last about 20 minutes. 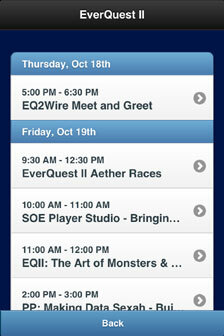 SOE Live Schedule Posted, Including EQ2U Data Panel!! 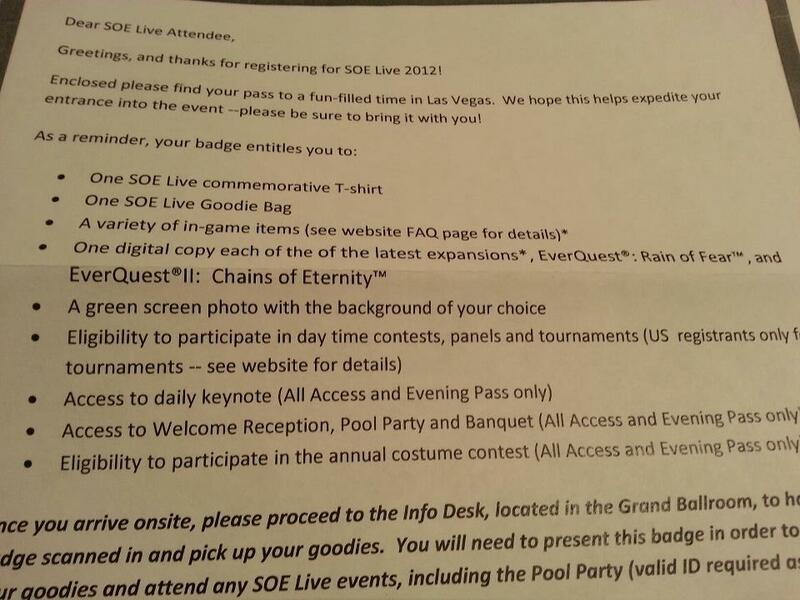 The second revised of the SOE Live Schedule has been posted. We’re still looking forward to the remainder of the Player Panels (marked as PP) to be added in, but if you are wanting to start planning out your days, here’s a good starting point. 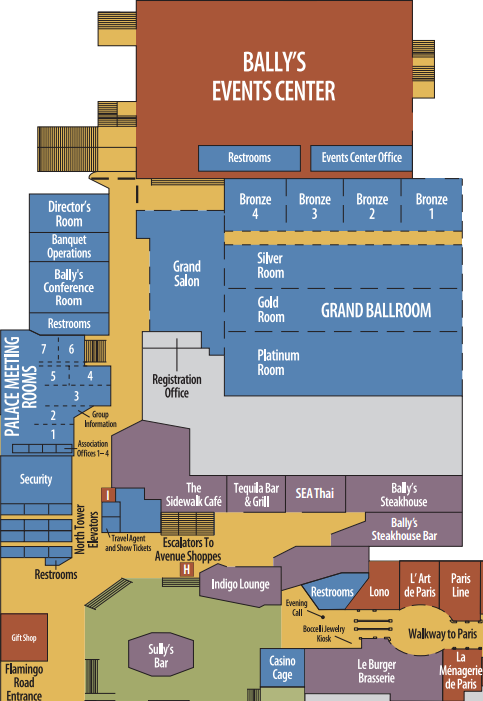 Thursday @ 7:00pm — SOE Live 2012 KickOff Reception and Keynote Address! Looks like SOE is really pushing Gaming Tournaments this year. SOE Live attendees have the opportunity to participate in countless events including a variety of gaming competitions, tournaments, and live quests for a chance to win thousands of dollars in prize money. In addition to the renowned costume contest, where attendees show off handmade outfits that showcase their fanaticism for gaming franchise favorites, attendees are encouraged to compete in a range of exciting in-game and live challenges including scavenger hunts, boot camps, PvP battles and live quests. Activities will test player agility, knowledge, dedication, wit, teamwork and problem-solving abilities.